Let’s talk about statement wins. That’s what the New York Red Bulls, Real Salt Lake, and Portland Timbers wanted to talk about this weekend. Those three teams showed what they’re all about as they each bagged three points against big-time foes. 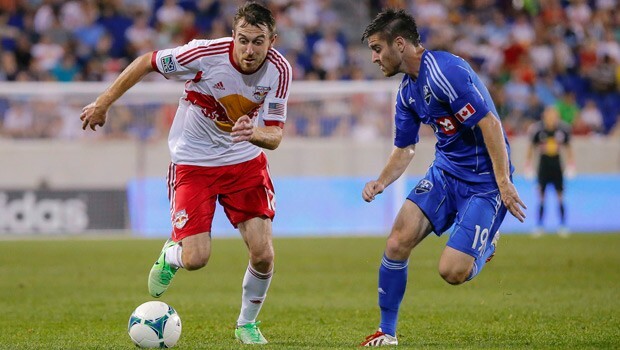 The Montreal Impact’s defense continued to leak goals in Saturday’s fixture at the New York Red Bulls, who put four past the visitors to cruise to a win. The home side went 2-0 up inside the first 20 minutes, with Eric Alexander netting his goal on 10 minutes as he dribbled past three defenders and struck low. Thierry Henry scored six minutes later with a deft tap-in off a cross from Fabián Espíndola, and the Red Bulls continued to dominate through the first half and the second as the Impact remained flat. In the 63rd minute, Tim Cahill made it 3-0 with a diving header off an Henry corner kick, and Péguy Luyindula sealed the rout with an 88th minute penalty after Lloyd Sam was brought down in the box. Montreal struggled to test New York all night and is now winless in four straight with continued defensive worries going forward. Real Salt Lake got their first win in Texas this weekend with a 3-0 victory over FC Dallas, securing their hold on top spot in the Western Conference. Dallas enjoyed chances to take the lead in the first half, but it was RSL who scored first against the run of play. In the 39th minute, Jair Benitez took a free kick for Dallas that hit the wall and sprung a counterattack for RSL. Javier Morales advanced on the left flank, nutmegged defender Zach Lloyd, and slotted a low shot home. The 79th minute saw RSL double their lead. Abdoulie Mansally found Ned Grabavoy open near the top of the box, and Grabavoy blasted a right-footed shot into the upper right corner. Olmes García capped the night off in the 90th minute when he volleyed in goal number three after Joao Plata whiffed his attempted volley. RSL is now undefeated in eight games and has won six of those eight, while Dallas is winless in seven. A last-gasp goal from the Portland Timbers sent the LA Galaxy home with nothing after a hard-fought, exciting match at Jeld-Wen Field on Sunday. The Galaxy opened the scoring after 17 minutes with a strong Marcelo Sarvas header off of a cross from Héctor Jiménez. The Timbers responded ten minutes later, restarting after a foul just outside LA’s box so quickly that the TV cameras almost missed it. Diego Valeri found Darlington Nagbe, who crossed to Ryan Johnson, who didn’t miss from close-range. It seemed that the match was headed for a draw, with both sides battling but neither finding the back of the net again. 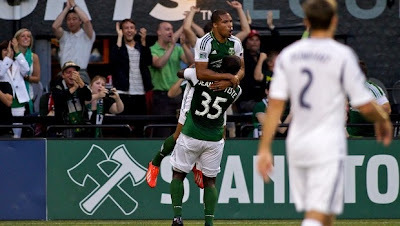 Then, in the fourth minute of second-half stoppage time, Andrew Jean-Baptiste headed in a Valeri corner kick and snatched the win for the Timbers, who are in sole possession of second place in the West. The Galaxy, meanwhile, falls to fifth behind the Vancouver Whitecaps and FC Dallas. Toronto FC announced on Saturday that captain Darren O’Dea is leaving the club. There is no word yet on where he will be playing next. Also in Toronto, defender Danny Califf has retired after 14 years playing professional soccer; he will remain with the club as a scout. With a 3-0 win over Toronto at the weekend, Sporting Kansas City have jumped into first place in the East. Elsewhere in the league, the San Jose Earthquakes grabbed a narrow (and much needed) 1-0 win over the visiting Seattle Sounders. Two midweek games are happening on Wednesday, with the Colorado Rapids hosting the New England Revolution and Chivas USA hosting Toronto. Then, Saturday kicks off with the Rapids heading to Seattle to take on the Sounders, while the New York Red Bulls travel to Toronto. The Montreal Impact welcome Dallas to town, the Portland Timbers hit the road to face the Philadelphia Union, and the Revs travel to Columbus. The Chicago Fire host D.C. United, and finally, Sporting Kansas City head to Rio Tinto to play Real Salt Lake while the LA Galaxy match up at home against the Vancouver Whitecaps. Camilo Sanvezzo. He scored two goals in the Vancouver Whitecaps 3-1 win over the New England Revolution. He’s got ten goals in his last nine games and leads the scoring charts with 12 so far this season.